We’ve noticed that the ads.txt file on one or more of your sites that you monetize through this AdSense account (pub-0000000000000000) is missing the correct publisher code. Even at some point, Google advertisements migh have stop serving / displaying on your site or blog (the ad's space will go blank). I know exactly how you are feeling right now because I was also in your shoe, It's really frustrating not knowing what is wrong. Worst is that, Before now there has been NO Solution to this problem on the Internet, Greatest surprise is that solution to the problem wasn't found on Google products forums which are supposed to be the number one solution center for all Google problems. Anyway I finally found a solution to this my self, and I am going to show You how exactly how I fix the notification or warning message on my Adsense account which reads Earnings at risk - One or more of your ads.txt files doesn't contain your AdSense publisher ID. Fix this now to avoid severe impact on your revenue. Now need You to read this article to the end carefully. In the top left, click the Down arrow. Click the blog you want to set up an ads.txt file on. Under “Settings,” click Search preferences. 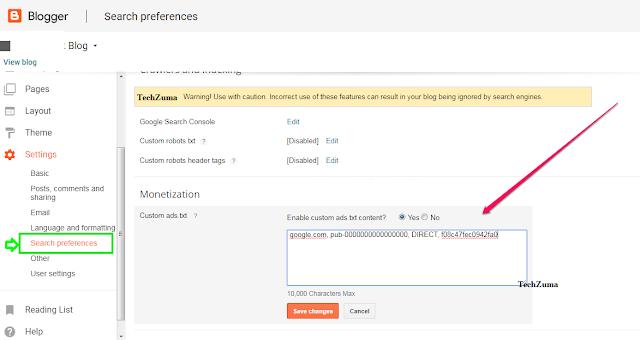 Under “Monetization,” find “Custom ads.txt” and click Edit. Click on the action button and you'll be taken to your Adsense sites management page. Google will automatically generate an Adt.txt file for you, now copy the code which will look similar to this google.com, pub-XXXXXXXXXX, DIRECT, XXXXXXX (please note that each Adsense account has his own unique code). Yours is different from mine. Paste the copied settings from your third-party monetization provider into the text box. Please note: If your blog or website is monetized with third-party providers or you’ve manually integrated AdSense in your blog, you will need to manually set up the content of the ads.txt file. On the other hand, If your blog is not manually integrated AdSense, i.e if you have directly linked your blog with your adsense account from the adsense Tab in blogger dashboard, then you do not need to manually set up ads.txt. Blogger will do this for you. 7. Now, configure the above rules and save them by replacing your own website name. 9. Now, Go to Basic settings on your Blogger Dashboard and uncheck the redirect option. Note: Your own publisher ID will be replaced with pub-0000000000000000. I hope to write more detailed article on this soon. But for now, You can add ad.txt file to WordPress via Ads.txt Manager Plugin. Logging in to AdSense account. Then navigating to Settings => Account => Account information. You will see Your publisher ID is in the format of pub-99999999999 with the nines replaced by your own 16 id digit number. Please note that the TAGID for Google is always f08c47fec0942fa0. Also, don’t forget to include the pub- part of your publisher ID, as this is apparently one of the common errors in ads.txt implementation for AdSense publishers. So with the ads.txt feature, this kind of advertisements will not be displayed on unauthorized site. Note: You don't need to Panic if Google stops ads serving on your blog or website. It was also STOPPED on my blog. Ads serving will automatically resume once Google has processed your changes and the notification will disappear in your blogger dashboard. The "ADS.TXT" (Authorized Digital Seller) is a list made by a website owner that contains publisher accounts and the names of ads networks that the publisher authorized to be showing of ads on his/her website. Ads.txt is simply a text file that sits on your server and lists the places authorized to sell ads on your behalf. The “ads” part of the name is an acronym for “Authorised Digital Sellers”. The idea is simple: Buyers can collect this data and be sure that if they’re paying for ads on rollingstone.com, then that is where those ads will appear (see an example from rollingstone.com/ads.txt). The file just lists the accounts that are authorized to sell the inventory, doing so in a format that can be quickly crawled and indexed. This article covers: ads.txt adsense, ads.txt implementation, ads.txt example, ads txt article, ads txt solution, ads txt content, ads txt press release, ads.txt blogger, ads.txt wordpress, ads.txt validator, ads.txt.